Fill your garden or patio with a tower of pink pompoms and be the envy of your gardening friends! These striking, compact clematis plants are perfectly suited to a pergola or trellis, flowering all summer-long with their unusual, fully-double pink blooms. Easy to grow and maintain but extremely rewarding, flowers are produced in early summe rand again in late summer/early autumn! 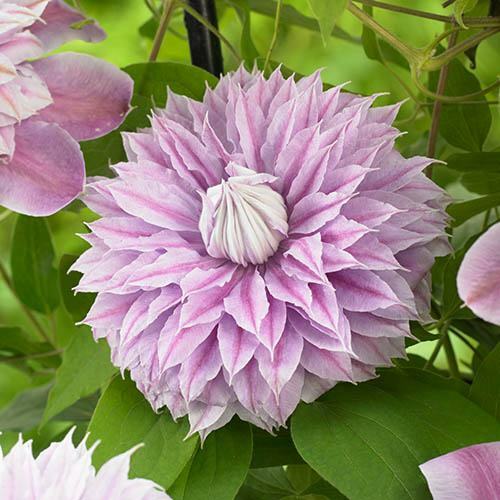 Expertly bred by world-renowned Clematis specialist Raymond Evison, these striking, compact clematis are perfect for growing up pergolas or trellis where their double, pink flowers will form a tower of colour. Considered to be one of the best pink doubles, Josephine is also ideally suited to growing in a pot on the patio as it have been bred specifically for smaller gardens and patios where conventional clematis can be too vigorous. With a much-reduced height at 2m or so, Josephine erupts into a cascade of stunning blooms, where each double flower has a central pompom of sepals which remain as the outer ones fall - giving a really unusaul display. A compact, repeat-flowering clematis, you can expect flowers in two waves, one in early summer and again in late summer/early autumn and plants will always produce their double blooms even after a hard winter. Pruning is a case of a simple tidy up - in late winter/early spring simply reduce all stems down to 15cm (6in) of soil level.